Recon photo taken after the bombing raids. "Entree Herman". An early postcard depicting the same enterance. 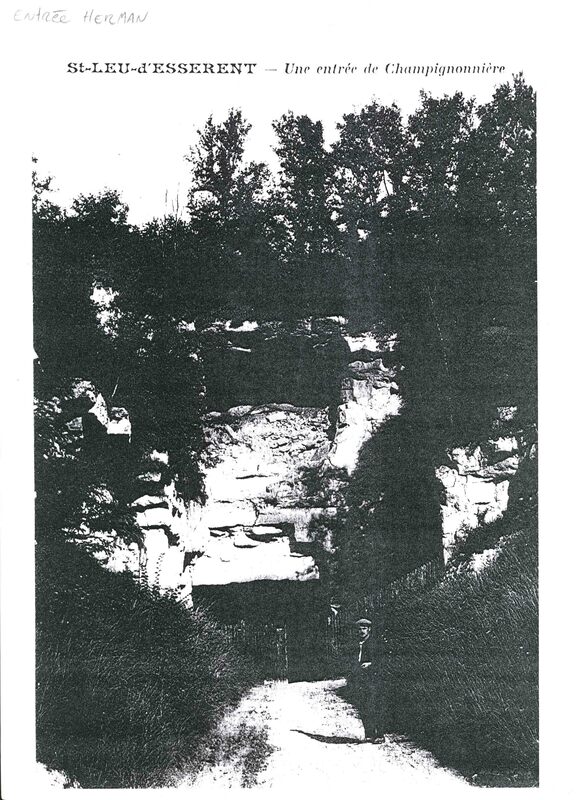 This recon photo of Entree Brault gives a good view of the out side structures. The structures number 1 to 5 still exist, the rest have been bulldozed over and covered by rubble. 2&5) Outside lodgings. Three of these building still exist but are totally overgrown and two have received bomb and fire damage. 4) This building has been partially destroyed and covered by rubble. In front is a Flak position. 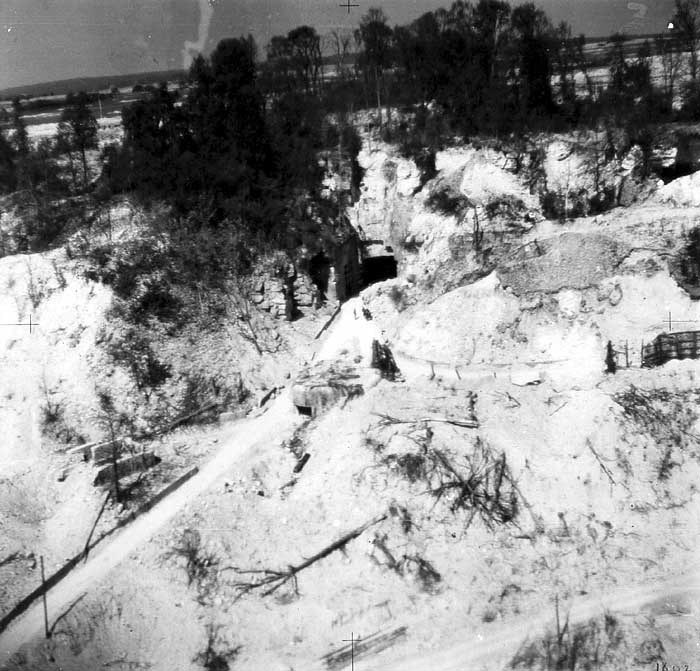 1) Modern & period picture of the bunker "Entree Brault"
The recon photo as seen on the home page shows that the target area is split into two zones; Saint Leu I & Saint Leu II. 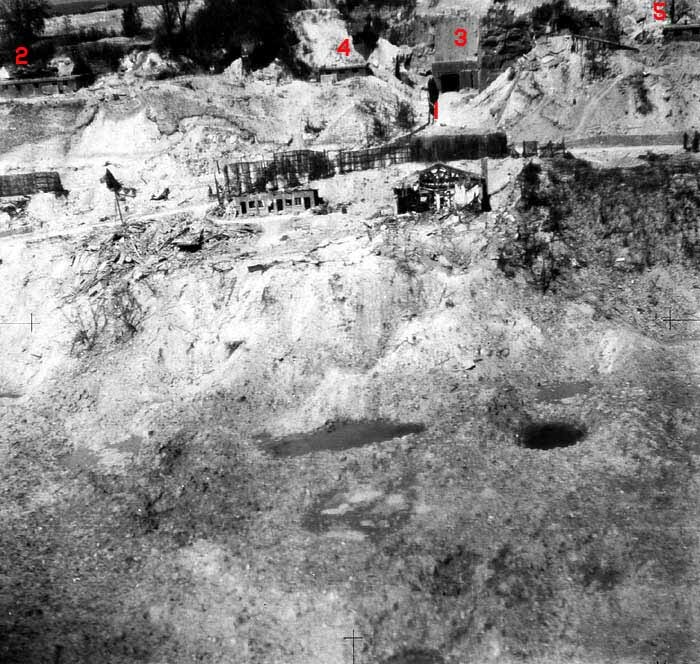 The recon photos below show the tunnel enterences of Entree Herman (Top) and Entree Brault (bottom) which are part of Saint Leu II. The recon photos should be placed next to each other with Entree Herman on the left and Entree Brault right. (Please note that they are not the same scale). RAF photography is incredable clear and gives us a good idea of what the devistation must have been like.